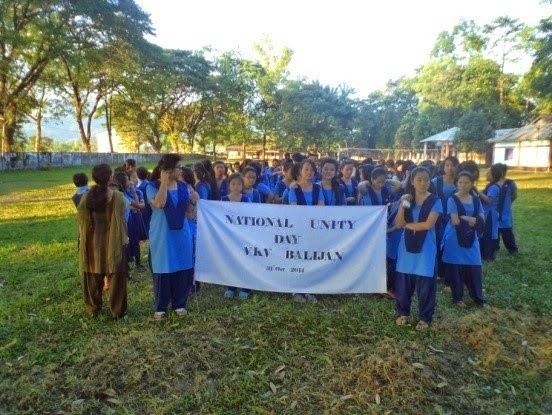 On this very day our school celebrated the birth anniversary of Sardar Vallabhai Patel. Who is also known as the Iron man of India for his great venture and contribution to our country. At Sharp 11:00 am. All the students and teachers gathered in the prayer hall to pray a tribute to Sardar Vallabbhai Patel on his birth anniversary. Our guest speaker was Sri Rajendra Prasad, the headmaster of Mahatma Gandhi Rastra Bhasa School Dufflagurh Assam. Other teachers who accompanied him were Sri Binod Tanty and Sri Ram Prakash Yadav (Teacher of MGRB School). The programme started with the patriotic song by our class-V students. The song thrilled our heart and culminated a patriotic zeal among us. Afterwards there was a speech by our guest speaker Sri Rajendra Prasad. He demonstrated to the students that Sardar Vallabbhai Patel is Known as The iron man of India because he had contributed in bringing about the unity among the people of India. He mentioned that Sardar Patel struggle to unite the states of Kashmir, Hydrabad and Junagarh. Our Guest speaker also highlighted some of the Sardar Vallabbhai Patel which is praiseworthy. Then Su. Upasana didi felicitated our guest speaker followed by the pledge which was taken by all of us. Thereafter Sri J. Manoharan Sir gave the vote of thanks to our guest speaker and it was followed by National Anthem with band.